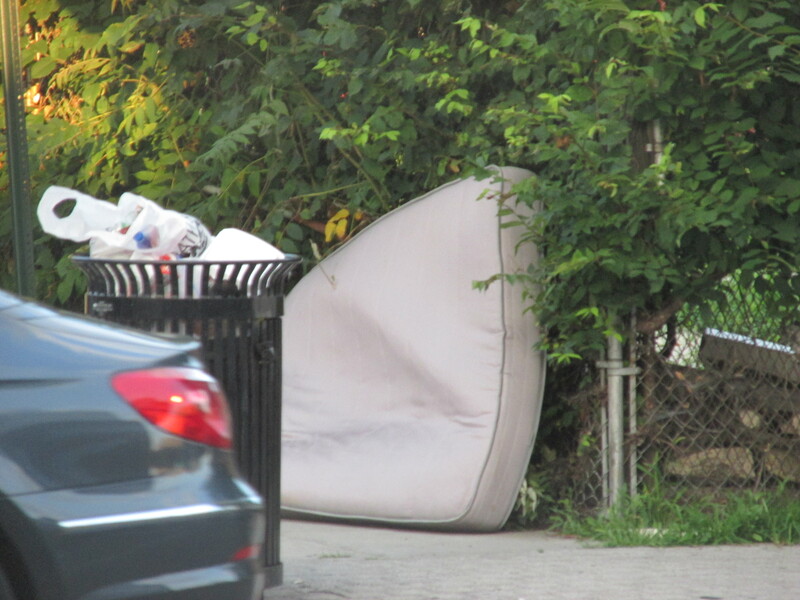 Seeking and End to Illegal Dumping | Park View, D.C. This entry was posted on January 8, 2016 at 7:01 am and is filed under Street trash. You can subscribe via RSS 2.0 feed to this post's comments. It’s a major problem all over Ward 1 and Ward 4. I’m not sure what can be done other than hope that people show a little more class and civic responsibility. The lack of provision for trash collection might very well be part of an explanation and it’s great that you’re pushing for the audit. Another small piece is the periodic problems with city services, which sometimes are due to the city services and sometimes due to other factors. For example, we didn’t have trash (or recycling) pickup for a couple of weeks in a row because the developer building a large new condo unit in the alley behind our house had the (public) alleyway blocked. Once our trashcan was full, we ended up taking small bags of household trash to the public can nearest our home. It was that or stacking trash inside our home or on top of the trashcan outside – neither of which was a better option. That problem seems to be behind us but there’s the ongoing, periodic issue with missed trash pickup. Your theory might make sense if there were any dwellings with four or more units in the vicinity of Warder and RCCR. But I dont think there are any like that nearby! I agree it is a problem though, and needs to be addressed. We need more general clean up in the neighborhood. I hate to see all the rubbish around and often stop to pick some up on my block when I’m walking home. Yeah, I’m not sure the 4+ unit rowhouse conversion theory holds water – it seems more like the author is projecting neighborhood dissatisfaction with rowhouse conversions onto a different, unrelated issue. I live in an adjacent neighborhood with no nearby 4+ unit rowhouse conversions and we still have a serious illegal dumping problem. There is at least one four-unit rowhouse conversion building on RCC Rd, though. I regularly see the residents from the rowhouses on the northwest and southwest corners of Rock Creek Church Road/Warder Street use the litter cans at that intersection. The house on the northwest corner is single family. The house on the southwest corner may be multifamily but it has a collection of city trash and recycle bins in the alley at the rear of the house. Thanks for the info. It’s so hard to track where the trash is coming from. On the recent walk through with Mayor Bowser, this issue was discussed and the question was asked if we had any idea who it was. Thanks for looking into this. One of my few complaints about the neighborhood is the amount of trash on the streets and sidewalks, and overflowing public trash bins seem to contribute to that. Another idea: what about adding covers to the top, so the opening is smaller and can only fit individual pieces of trash or small bags? It’s definitely not a complete solution because I’ll see bags to the side of the bins now, but maybe it would help discourage some dumping. I have long been frustrated with this. The can at RCCR and Warder is Exhibit A. Could homeowners in the vicinity get leaflets telling them to please stop any illegal dumping or notify someone as to who are the offenders? At all of our community groups and ANC meetings could we make a renewed effort to inform everyone this behavior is not tolerated? The city is expanding use of cameras for speeding — how about a camera on troubled cans to capture identities of offenders? A sign could say “This can is monitored by cameras to deter illegal dumping, leave bulk trash at your own risk.” A sting is probably unrealistic, but I would love to see an illegal dumper handed a citation by an authority immediately after he or she dumps. These are just some ideas — and maybe not good ones — you all probably have many more. A comprehensive effort is needed. 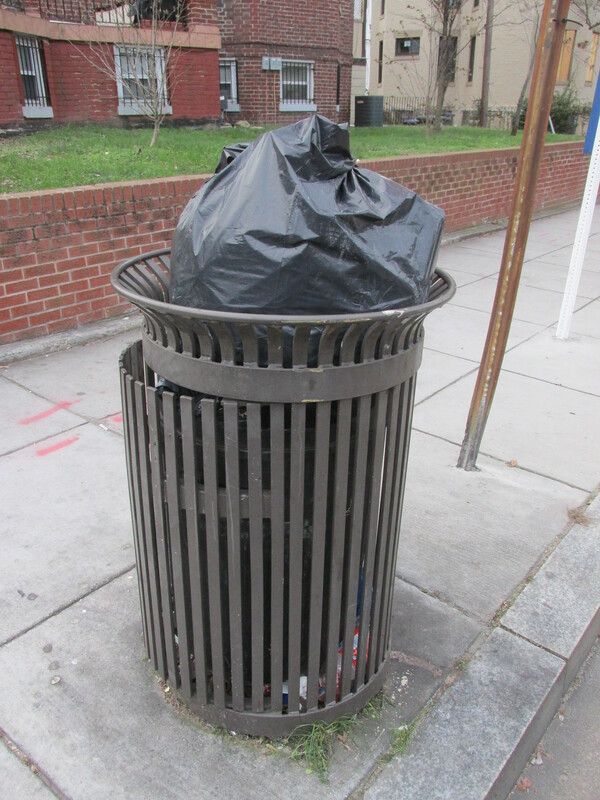 Another example is the trash bin in front of Eddie Leonard’s on Georgia Ave. It is very common to see it overflowing on weekends and holidays, and sometimes on work days as well. The fact the Eddie Leonard’s doesn’t have a trash can for customers to throw away any unneeded or used packaging may be a factor, but I don’t know if it’s the main one or not. Is there a city number to call when we see it overflowing? Could the ANC do some outreach to business owners to see what they can do? solution – hire a team to go through and open up the trash bags to find identifiable information and fine the party responsible. There used to be one of these trash cans right outside of my front door. I know that it was intended to be used for small trash but it became a dumping site. The litterbugs with their candy wrappers and soda bottles still littered and meanwhile there were piles of bed bug riddled mattresses, furniture, broken mirrors, you name it, piled around the trash can on a weekly basis. People also used it to dispose of dead rats and mice, which in the summertime the smell becomes unbearable. I think it should be illegal to have these cans within a certain proximity of someone’s front door. It was like living in a biohazard zone. Not healthy at all. When I have seen people dumping in the can at Lamont and Warder they have rolled up in a minivan. It doesn’t seem to be a hyper-local issue. My issue is with the allotted trash cans for each household. They are way too small. The cans can only hold 1 or 2 tall kitchen trash bags. With a family of 4 my can is always overflowing and piled on top. I regularly have to make trips to the dump because I can’t fit all my trash in the provided bins. Meanwhile the recycle bins are huge. Funny, our house of 3 rarely fills up the trash over the course of 2 weeks but we need more space for recycle. We should trade shares of bin space. I have noticed houses (single family) who have ‘acquired’ 4+ trash cans and our trash bins have been ‘re-purposed’ twice. We learned to write down the number on the can. Does the city track how many allowed cans are at each address?